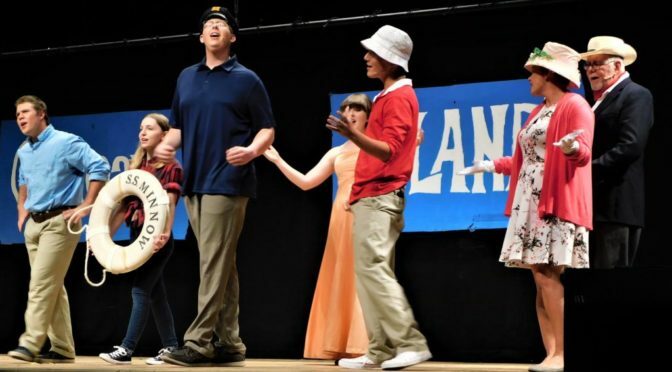 Castmembers sing the opening song, “The Ballad of Gilligan’s Island” Saturday night at the Ellis Fine Arts Center at Fort Scott Community College. 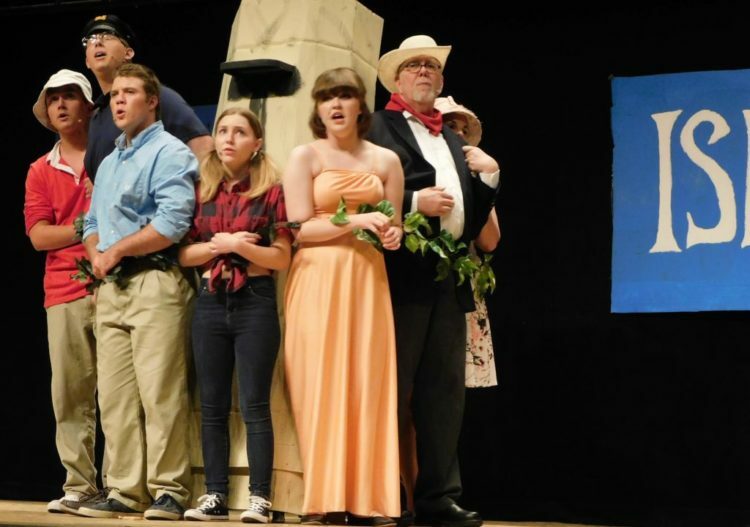 From left: Jasper Dunn, Katie Button, Jared Oshel, Fayelyn Kmiec, Aiden Ballinger, Karri Johnson, and Harold Hicks. 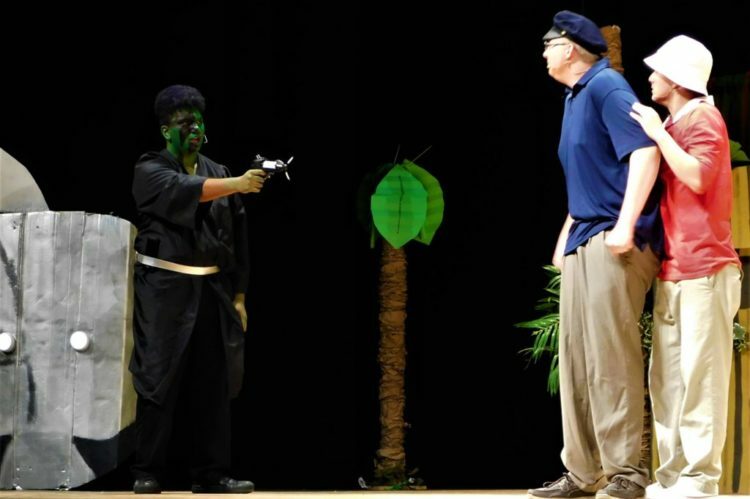 Oct. 19-21, Fort Scott Community College Theatre members presented the musical version of “Gilligan’s Island”. “Gilligan’s Island” was a comedy TV program from the mid-1960s. 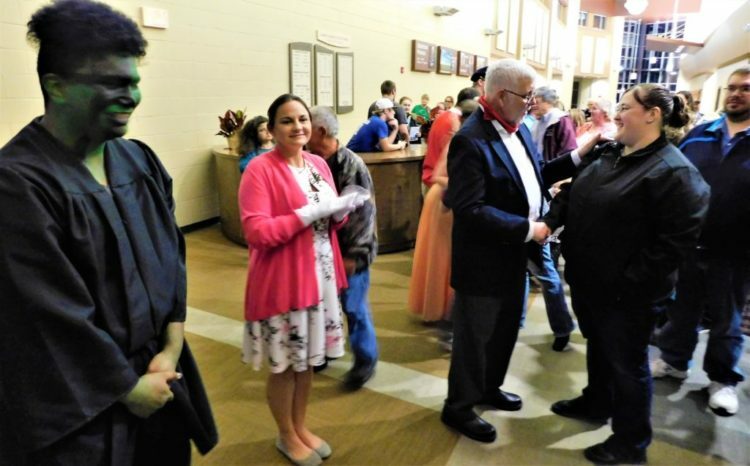 Any musical is a challenge for a small department, director Allen Twitchel, stated in the bulletin for the show. “We are attempting to produce a professional-quality show with cardboard and crepe paper while juggling everyone’s busy schedules,” Twitchel said. The group of students and college staff worked diligently to exceed all expectations, Twitchel said. Listening to the audience chuckle and clap, the audience seemed to agree. The setting is a deserted island in the Pacific Ocean, where seven people are stranded during a shipwreck. They come to grips with the situation, work on schemes to get off the island and are visited by a visitor from outer-space. Gilligan was portrayed by FSCC student Aiden Ballinger, Skipper by former FSCC student Jared Oshel, Mr. Howell by FSCC English IntructorHarold Hicks, Mrs. Howell by FSCC Office Assistant Karri Johnson, Ginger by FSCC student Fayelyn Kmiec , Professor by FSCC student Jasper Dunn, Mary Ann by FSCC student Katie Button, and Alien by FSCC student Marcus Robinson. Several solos were performed by Ballinger, Button, Kmiec, Dunn, and Hicks. Gilligan and Ginger both have an emotional meltdown when the castaways learn they are stranded on a deserted island. The group ties itself together in preparation of a hurricane. The outer-space alien, played by Marcus Robinson, left, aims a weapon at the Skipper and Gilligan. The group sings “Worlds Apart” in one of the final scenes of the play.